Not all adventures take place on land - the ships that sail the waters of the Inner Sea and surrounding oceans provide countless sources of excitement, plunder, and naval exploits. Whether the adventurers are simple passengers attacked by pirates or intrepid sailors running an enemy blockade, the ships presented in this book give Game Masters the tools they need to run fantastic adventures on the open sea. The Burnt Saffron, a slave galley said to have strange powers granted by Asmodeus in exchange for spreading slavery throughout the Inner Sea. The Cetaceal, an Andoren ship serving the Gray Corsairs, the naval branch of the abolitionist Eagle Knights. The Hu-Hazhong, a Tian junk from the distant Dragon Empires, traversing the waters of the Inner Sea with ambitions of lucrative trading. The Impervious, a Chelish man-o'-war carrying a contingent of merciless Hellknights and part of the blockade against Pezzack. The Kraken's Spite, a viking longship built from the wreckage of a doomed invasion fleet, now serving no king and calling no port home. The Mark of Yunnarius, a ghost ship captained by a vengeful banshee, haunting the edge of the Eye of Abendego. The Ravishing Ruby, a pirate ship with a ruthless captain intent on retrieving her stolen magical treasure map, no matter the cost. 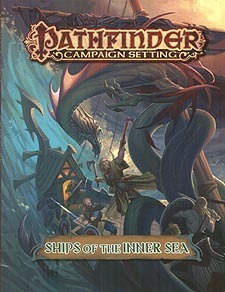 Pathfinder Campaign Setting: Ships of the Inner Sea is intended for use with the Pathfinder campaign setting, but can be easily adapted to any fantasy world.